Back in 2012, Genndy Tartakovsky, celebrated animated creator of Dexter’s Laboratory and Star Wars: The Clone Wars, presented his animated tale Hotel Transylvania to moviegoers. While not as endearing or poignant as a Disney / Pixar film, the movie itself was highly enjoyable, offering up a kid friendly “horrors” and monster galore in a a comedic atmosphere. Viewers, especially the younger audience, loved the movie as it profited over $350 million worldwide; not bad for a movie that took only $85 million to make. Three years later, Sony Pictures and Genndy Tartakovsky return to the hotel with whole monster gang in Hotel Transylvania 2. Is it worth re-checking in too or is it best to find another hotel (movie) with better rates? Set sometime after the events of the first movie, the human Jonathan (Andy Samberg) and the vampire Mavis (Selena Gomez) are happily married and are soon to be parents, thrilling Mavis’s father, Dracula (Adam Sandler). Eager to celebrate the next vampire generation in the family, Dracula is at odds when the boy, Dennis (Asher Blinkoff), favors his human lineage, unable to produce fangs and become a young bloodsucker. Still loving his grandson but hoping to turn him into a young vamp, Dracula sends Mavis and Johnny off to California to visit with Jonathan’s parents, while he attempts to show Dennis the ways of being a monster. Joined by Frankenstein (Kevin James), Griffin (David Spade), Wayne (Steve Buscemi), and Murray (Keegan-Michael Key), Dracula hopes to bring out Dennis’s vampire side through a series of proper “monster” demonstrations. Mavis, on the other hand, is experiencing a different side of life she’s been missing out on, pondering the idea of moving to California with Jonathan to keep Dennis with his own kind. I remember seeing the preview for the first Hotel Transylvania had simply “blew it off”, believing it to be just another generic run-of-the-mill animated. However, after seeing the trailer for Hotel Transylvania 2, I decided to give the first film a chance and purchased a blu-ray copy of the movie. To my surprise, I actually did like Hotel Transylvania. I thought it was funny and lighthearted with some great voice acting and some iconic horror monster references. 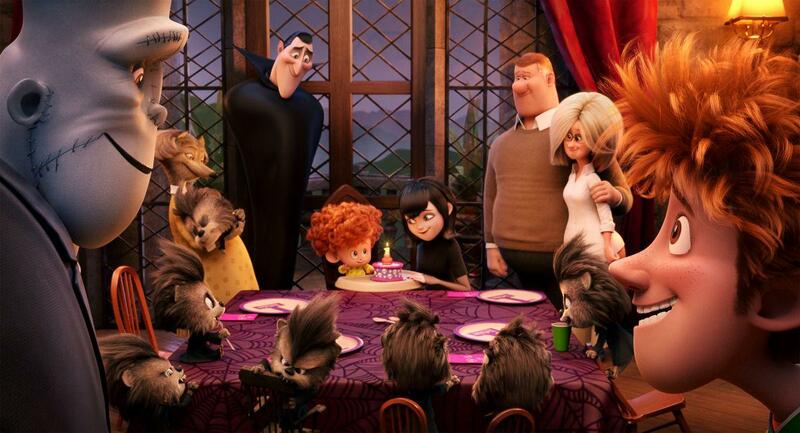 Hotel Transylvania 2, its intended follow-up sequel, has made some improvements, but, while it’s still a kid friendly monster romp, ultimately bites off a little more than it can chew. As I said above, Genndy Tartakovsky returns to the director chair for his second go-round into the animated world of colorful CG monsters. With the first film establishing all the characters and the whole “monster hotel”, Tartakovsky has more room to play with and hits the ground running. The movie is vibrant display of colors and visual feast for the eyes. Tartakovsky has a talent from being imaginative and certain does show that his various monster that populate the screen. Rather than creating realistic proportionate bodies, Tartakovsky has a very unique style for each character and articulates that with their facial expressions and body movement. The humor in the movie returns with laughs, but has been dialed back from its adult oriented humor and gear towards more children (whether that’s a good or bad thing is up to the viewer). Yes, I’ve noticed a difference, but I still laughed out at all the animated slapstick comedy and probably more so than recent live action feature films. Also, continuing the first film, Hotel Transylvania 2 loosely tackles the subject matter of tolerance and acceptance; good core values for kids to learn. 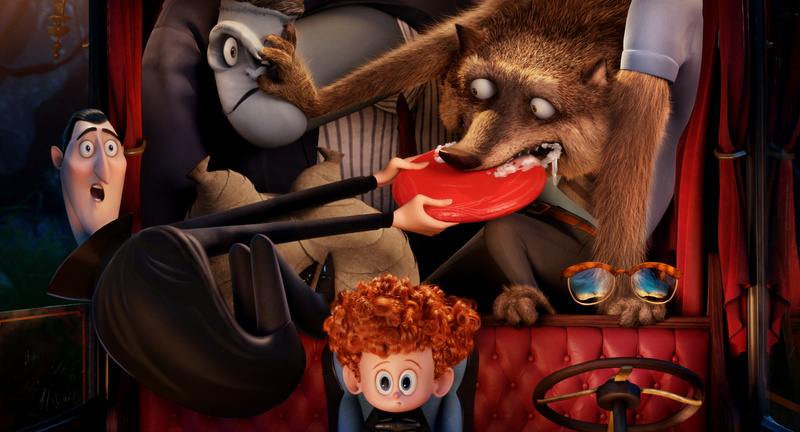 Unfortunately, Hotel Transylvania 2 doesn’t rise above its first installment. In this sequel, certain characters are more in the background, some minor subplots are unresolved, and the film’s third act seems like a tonal mistake (introducing certain characters and a conflict battle) as if it was tacked towards the end of production. Also, the whole concept of the actually “Hotel Transylvania” seems less important in this sequel. I know it’s not complete deal breaker for the movie, but the aspect of the hotel played more of an instrument role in the previous film. This time around, it’s just simply a set piece for several scenes. Additionally, the movie’s first five or so minutes rushes through some important events. Told through a montage sequences, the movie opens up Mavis and Jonathan’s wedding, which is followed by the birth and Dennis and his first several years. Personally, I think this could’ve been whole entire movie unto itself rather than a simply montage opening, feeling like Tartakovsky wasted an opportunity. While Hotel Transylvania 2’s story is a little sub-par from its predecessor, the actors and actresses that lend their voices for the film’s colorful characters are top-notch, with comedian Adam Sandler leading the charge. While Sandler’s recent movie endeavors have been criticized (label as “lazy work on his part” or “sleepy walks through scenes”), his vocals are suited well for Hotel Transylvania’s Dracula. Perhaps Sandler is best heard (mostly in animated movies) and not seeing in his live action features. Regardless your stance on the comedian, Sandler proves to be great as the film’s central character, offering cartoon-ish moments of dialogue (comedy and drama) that works well with Sandler’s voice and his Transylvanian on-screen counterpart. The two love interest in the first Transylvania movie (Mavis and Jonathan) return in the sequel, accompanied by their original voice talents Selena Gomez and Andy Samberg. Gomez’s Mavis is given a little bit more range with her character have her own anxieties and fears of how raise her son, while Samberg’s Jonathan is more there for comic relief (which is fine and suits his character). Likewise, many of Dracula’s monster friends, including Kevin James’s Frank, Steve Buscemi’s Wayne, David Spade’s Griffin, and Keegan-Michael Key’s Murray (who replaced CeeLo Green from the first movie) are, more or less, framing the feature with smaller roles, but with some better dialogue lines, and recurring gags. Additionally, just like the first Hotel Transylvania, Drac’s friends continue to give a counter-balance perspective on certain things, giving each of the monsters one or two moments in the spotlight. The most surprising is the semi-addition to the group is the character of Blobby. He was featured in the first movie, but has been upgraded to be more in this movie. Blobby may not be the most vocal one in the group of monsters, but you simply just can’t help but laugh whenever he’s on-screen. Newcomer to the movie is legendary comedy actor Mel Brooks, who lends his voice as Dracula’s father Vlad and does good job as the crusty “old world” vampire. The same goes for Jonathan’s parents (Linda and Mike), who are voiced by husband and wife duo Megan Mullally and Nick Offerman. Additional voices for Hotel Transylvania 2 included Molly Shannon, Fran Drescher, and Rob Riggle. Is Hotel Transylvania 2 going to win over viewers who were unimpressed with the first Hotel Transylvania? Hmmm….probably not. Tartakovsky’s latest trip to the hotel for monsters has some variant improvements made over the first film, but there’s still not enough substance from the film to considered being a definitive classic in the animated genre. Still, Hotel Transylvania 2 knows its intended market and hits all the right notes (and its target), offering up a cute and ghoulish CG kids film that has talented voice actors, a crisp visual design, and moments of monster fun hilarity. Personally, I liked it and enjoyed watching the film (recommending it to younger viewers and to those who just simply like cartoon escapism), but it wasn’t as good as the first Hotel Transylvania. All in all, Hotel Transylvania 2 was a nice continuation to the original film.